1. Ger R. The management of certain abdominal herniae by intra-abdominal closure of the neck of the sac. Ann R Coll Surg Engl 1982; 64:342-344. 2. Bogojavalensky S. Laparoscopic treatment of inguinal and femoral hernia (video presentation). 18th Annual Meeting of the American Association of Gynecological Laparoscopists, Washington, D.C., 1989. 3. Salerno GM, Fitzgibbons RJ, Filipi C. Laparoscopic inguinal hernia repair. In: Zucker KA, ed. Surgical Laparoscopy. St. Louis: Quality Medical Publishing, 1991:281-293. 4. Toy FK, Smoot RT. Toy-Smoot laparoscopic hernioplasty. Surg Laparosc Endosc 1991; 1:151-155. 5. Schultz L, Graber J, Pietrafitta J, et al. Laser laparoscopic herniorrhaphy: a clinical trial, preliminary results. J Laparoendosc Surg 1990; 1:41-45. 6. Arregui ME. Preperitoneal repair of direct inguinal hernia with mesh. Presented At Advanced Laparoscopic Surgery: The International Experience, Indianapolis, May 20-22, 1991. 7. Neumayer L, Giobbie-Hurder A, Jonasson D, et al. Open mesh versus laparoscopic mesh repair of inguinal hernia. N England J Med 2004; 350(18):1819-1827. 8. Stoppa RE. The treatment of complicated groin and incisional hernias. World J Surg 1989; 13(5):545-554. 9. Ferzli GS, Frezza EE, Pecoraro AM Jr., et al. Prospective randomized study of stapled versus mesh in laparoscopic preperitoneal inguinal hernia repair. J Am Coll Surg 1999; 188(5):461-465. 10. Phillips EH, Arregui M, Carroll BJ, et al. Incidence of complications following laparoscopic hernioplasty. Surg Endosc 1995; 9:16-21. 11. Felix EL, Michas CA, Gonzalez MH Jr. Laparoscopic hernioplasty transabdominal preperitoneal vs. totally extraperitoneal. Surg Endosc 1995; 9(9):984-989. 12. Felix EL, Harbertson N, Vartanian S. Laparoscopic hernioplasty: significant complications. Surg Endosc 1999; 13(4):328-331. 13. Fitzgibbons RJ, et al. Laparoscopic inguinal herniorrhaphy: results of a multicenter trial. Ann Surg 1995; 212:3. 14. Gersin KS, et al. Missed lipoma of the spermatic cord. 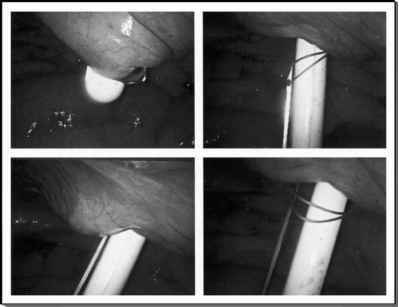 A pitfall of transabdominal preperitoneal laparoscopic hernia repair. Surg Endosc 1999; 13:6. 15. Felix EL, Michas CA, Gonzalez MH. Laparoscopic hernioplasty: why does it work? Surg Endosc 1997; 11:36. 16. Smith AI, et al. Stapled and nonstapled laparoscopic transabdominal preperitoneal (transabdominal preperitoneal) inguinal hernia repair: a prospective randomized trial. Surg Endosc 1999; 13:8. 17. Farinas LP, Griffen FD. Cost containment and totally extraperitoneal laparoscopic herniorrhaphy. Surg Endosc 2000; 14:37. 18. Kozol R, et al. A prospective, randomized study of open vs. laparoscopic inguinal hernia repair: an assessment of postoperative pain. Arch Surg 1997; 132:292. 19. Payne JH, et al. Laparoscopic or open inguinal herniorrhaphy: randomized prospective trial. Arch Surg 1994; 129:973.